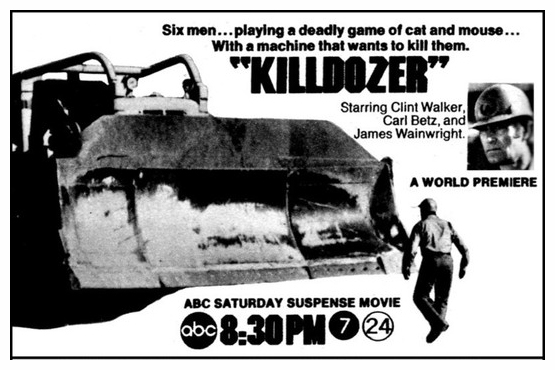 Killdozer was written by noted SF author Theodore Sturgeon. Published in 1944, the original novella became one of his most popular works. For this TV adaptation, he was brought in to work on the screenplay. One can hope that what we saw on our small screens was close enough to what Sturgeon wanted. The original story was set on an island in the South Pacific, where the crew was preparing an airstrip for use in the war. The being was released when they demolished a ruined temple. In the movie, the crew is preparing the way for an oil refinery or something like that on an island off the coast of southwest Africa. Here, the entity is an alien who came to Earth in a meteor. As it happens, this is one of the more typical made-for-TV-movies. Except for the crew boss, the characters are pretty much interchangeable. There’s the black guy, the young guy, the cigar-smoker… You’d be hard pressed to remember their names. And the crew follows the “One Radio Rule” which states that whenever a group goes to set up a base in a remote area and will be out of easy reach for rescue, they will have one and only one radio (and not even any spare parts) with which to call for help. I suppose that the necessities of prime-time TV – no blood, no swearing, etc. (and don’t forget commercial breaks) – made it hard to build up the tension. It’s a simple matter of wondering who will survive, and how they will defeat the Killdozer. You can probably figure out that the crew boss will make it – he is the boss, after all, and the only character with any real development. Interestingly, the other reviews I’ve read of this on horror movie blogs all note that if you were a kid, you’d find the idea of a killer bulldozer really cool and creepy! I can see their point; if you’ve not yet been totally jaded by schlock, the idea has potential. As I said, these movies are at least competently made. The director, Jerry London, does his best to make the D9 bulldozer look ominous. The cast reacts to it in a sufficiently convincing fashion. And thanks to fine camera work, you never see anyone at the controls of the D9. Perhaps it would have been better if instead of filling a 90 minute time slot, it could have been an episode of an hour-long anthology series. Speeding things up would have certainly improved the pacing. In any case, it’s a decent example of its genre – interesting ideas turned into a way to fill a time slot with “good enough” entertainment.